Builders Site Protection is always focused on adding new and varied products. Our latest product addition is Trimaco’s X-Board, a stronger floor protection alternative to building paper and scrim paper. X-Board is a 35″ x 100′ (291 sqft) temporary floor protection designed with lightweight remodeling, painting, and restoration projects in mind. Breathable and spill-resistant, X-Board is an ideal surface protection for hardwood floors. 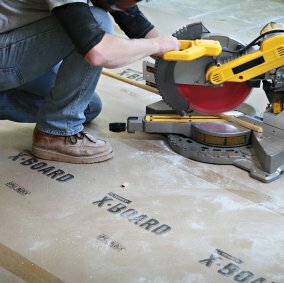 X-Board is plyable enough to be wrapped around interior corners, cabinets, countertops, and other common fixtures. X-Board lays flat, and can be quickly taped into place. Single rolls of X-Board cost $32.99, and discounts on pallet and case quantities are available upon request. For further information and price quotes including shipping email us at sales@buildsitepro.com and we will respond shortly. This entry was posted in Exciting New Products, Surface Protection, Uncategorized and tagged floor protection, new products, ramboard, surface protection by admin. Bookmark the permalink.